Took a few shots of the happy team who’ve been renovating the attic today. The fire doors are all installed and now the decorators are doing their stuff. The bedroom looks a lot larger without the mad youth group painting scheme. Now we need to get some carpets down and assess where we are with furniture and curtains and keep everyone supplied with Vicarage baking. Some more masonry fell off our church tower sometime between yesterday evening and this morning. Into our car park. Good thing the prayer meeting (when cars were parked out there – and people coming and going) was yesterday. Looks like the continuous rain has been loosening the sandstone. Seems like there’ll be some more work for the steeplejacks. In the meantime Rocky and our hardworking lay reader have been out with stripey tape, putting the carpark out of action. 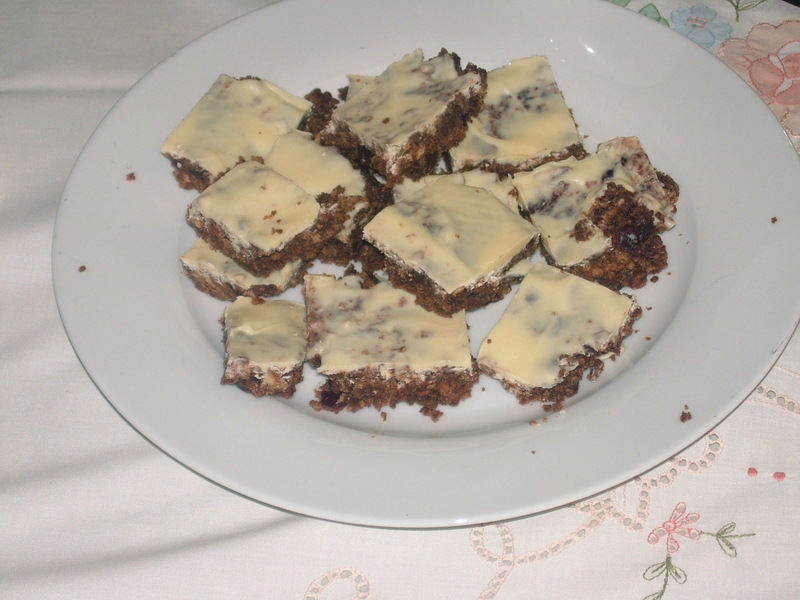 Fridge cake aka tiffin is a very useful no-bake Vicarage staple. It uses store cupboard ingredients and can be made quickly, although it needs a few hours to set in your fridge – if you’re overeager to consume it, it can be rather too crumbly and sticky. Place the butter, cocoa powder, golden syrup, sugar and dried fruit in a large microwaveable bowl with lid and heat on full power for 2-3 minutes. If you don’t have a microwave, you can do this over a low heat in a saucepan. Once the butter has melted and the sugar has dissolved, add the crushed biscuits and mix thoroughly. Place the mixture in a small roasting tin (about 20cmx30cm) that has been lined with cling film and level it out into the corners. Cling film is the best way to avoid sticking AND excessive washing up. Place the tin in the fridge whilst you melt the chocolate topping. I usually use 200g white chocolate for the topping for this, but it is a little skimpy – 400g would give you a really good layer on top. I melt the chocolate in a jug on defrost in the microwave, but also sometimes use the old method of a bowl on top of a pan of boiling water. Usually when the last lot of chocolate was burnt in the microwave, alas. Using a knife, spread the chocolate over the now slightly cooled base and then refrigerate the lot for a couple of hours – preferably overnight. Use a sharp knife to cut it into pieces to serve with strong coffee. Upupstairs (as it’s called) is beginning to take proper shape now. Our recent days have been filled with carpet quoters and a succession of tradesmen hefting new firedoors in and about. It’s looking lovely. The kitchen has almost more work surface than mine. The Vicar and I have been talking about moving up there and leaving the MTs to it with the kids on the lower floors. Rocky mentioned that he’d then have the woodburning stoves on the ground floor, which I must admit is still a bit of a draw for living in our allocated space rather than heading skywards. On our return journey from Scotland, we were delighted to be able to make a pitstop in Leyland in Lancashire. Leyland is a smallish town with a lively church in the centre. And for one day only, timed perfectly for our return south, the maker of the soundtrack to our lives since children have joined us, Colin Buchanan, was playing a concert. Colin has a new album out – God Rock – which we had already listened to for most of the journey. It was great to hear the new material – and some old favourites – live and presented with lots of laughs. He still has eight UK dates left to play so you might be able to catch him live yourself. Highly recommended for primary school aged kids. The Queen is in Year 6 and enjoyed herself immensely. On the clip below there are a few samples of songs from the new album. I really think Bear Grylls should hear the Survival Man song. We also have a lovely pic of the kids with Colin but we haven’t quite worked out how to transmit it from the Vicar’s new phone, so you may have to wait for that one. We came back from a week’s holiday in Scotland late yesterday afternoon. We couldn’t get the car on the drive to unload it as the drive is full of skip for debris from the attic renovations. So we parked near the back gate so we could take our stuff in through the back door. Tired and happy, we planned to unpack as fast as possible and get everyone into bed ready for school and the start of a busy term. As soon as we’d emerged onto the pavement, just next to the churchyard, we realised things might take a while longer than we hoped. The half dozen or so kids playing there were very excited to see us and wanted to fill us in on all the things that had happened whilst we were away. The most prominent episode had been some naughty kids hopping into our garden over the wall and causing some damage to one of our (thankfully) cheap plastic tables. All the kids wanted to tell us the same thing at the same time and transmit their information in those squealy high pitched voices they save for important communications.